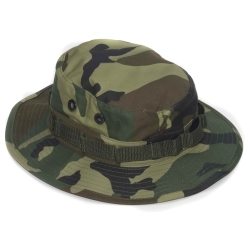 Replicate camouflage military boonie hat. The boonie hat is a variation of the bucket hat, having a larger and stiffer brim. From the late 1960’s and on the boonie hat has been issued with U.S. military uniforms. This hat is perfect for pairing up with any one of our military costumes. Hat is one size and will fit up to a 23.5" head measurement.